As much as I love getting into the kitchen on the weekends to make a tall stack of pancakes, waffles or eggs with potatoes—I love potatoes, you know this. I know this. Let’s leave it at that—sometimes the whole traditional breakfast thing is just a bit boring. A little outdated and not too exciting. Don’t get me wrong though because I still love me some eggs and potatoes and I can never say goodbye forever to pancakes or waffles. I’m not a monster. We do need to stir things up a bit, though, and get out of our comfort zone. We need to party. We need to be adventurous when it comes to our first meal of the day. I’m all for trying new things. I’m also all for having people try new things for me, watch their reactions and then decide if it’s worth my time. There’s nothing wrong with having them be my guinea pigs. How else am I supposed to decide if I like something or not, if I don’t trick people into trying it for me? I’m probably doing them a favor, if you really think about it. They should be thanking me for opening up their minds and expanding their palettes. I don’t want to say that they should name their next child after me BUT the world could always use a few more Jonathans. There’s just never enough of us hanging around. On days when I want to do things a bit differently, I start to think of new ways to wow people during brunches or breakfast gatherings with my family. One of the greatest things to happen to our lives (you and I) recently was this Breakfast Pie. It’s everything you want in a pie first thing in the morning. Don’t fight it, just embrace the craziness. That was last week though, I’ve moved on. This week it’s something entirely different. 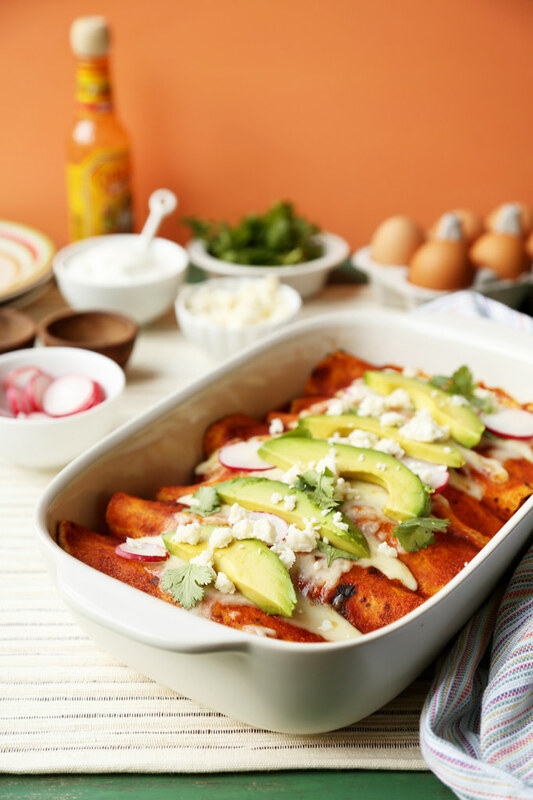 This week I’m bringing to you (drumroll please) breakfast enchiladas. Yes, you read that right. Chorizo and Egg Breakfast Enchiladas. Talk about madness, but at the same time, talk about genius. Sometimes all the things we want for breakfast like scrambled eggs, chorizo, shredded potatoes, black beans and cheese are just 100 times better than we could ever possibly dream of, when they’re all rolled inside of corn tortilla. Breakfast of champagnes? I think so, friends. I think so. The only question that needs to be asked right now is why aren’t you running into the kitchen to make this incredible dish right this very second?! Good thing we have all weekend to fix this dilemma. I see enchiladas in our future, but more importantly, I see us going in for seconds and thirds and I see us having the best weekend ever. Nobody can stop us now.